With activation codes now being used to activate the energies of each ebook, Love Inspiration is no longer able to monitor and check whether each of the pre-requisites and necessary waiting timeframes have been adhered to. Within each ebook and course, you will find the important pre-requisite information in the first few pages, just before the activation process. By satisfying the pre-requisites, you have ensured that the necessary energetic preparations have been completed and you can therefore proceed into the new energies, attunements and healing practices. ​Within each of these ebooks, you will also see information being presented about the various levels, attunements and suggested timeframes for completion. This information will often include a number of resting days or other suggested waiting timeframes which help the energies to be digested and assimilated into your energy field safely and effectively prior to moving forwards. These timeframes have been suggested by the Higher Consciousness entities responsible for bringing through the energies and as such, it is very important that these suggested waiting timeframes be followed throughout the courses wherever possible. timeframes, pre-requisites and attunement processes wherever possible! This includes adhering to all suggested rest days and all suggested waiting timeframes, both in between attunements on in between volumes of ebooks. It is important here to re-iterate that all of our healing systems and Ascension Pathways have been divinely designed and these waiting periods and rest days have also been brought through so that recipients can receive these energies safely and effectively. Therefore, to ensure that you gain the most out of your experience with us, we lovingly ask once again that you please read through each ebook carefully and follow along with the divine instructions with love. “Remember your energy body must be fully ready to move into the next level of teachings; if it is not and you take the next level before the allocated timeframe, the energies may not work as well as they should, because your energy system will not be able to assimilate them. Its like trying to put a roof on a house with no or only partially built walls. The specific timeframes are in place for this reason - please follow them correctly for the best results. This is not a race; enjoy the journey to your fullest potential!" "The Ascension Pathways are indeed a great investment of time, energy and commitment. Please ensure you are able to adhere, as best you can, to the indicated timeframes with the ebooks. These have been given with your best interests in heart. Many of the energies are downloadable in shorter spaces of time, however unless you are a very, very advanced practitioner, please allow yourself the allocated timeframes, for we do not wish to inundate your energy flow with great steps of advancement, often. 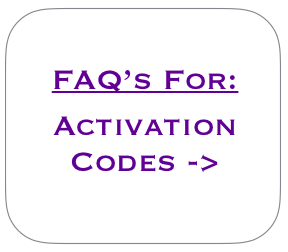 - What are activation codes and how do they work? - Why does Love Inspiration use activation codes?